After a few drinks we headed over to Sally’s. Although we were seated around 5:15 and ordered around 5:30, our pizzas took more than an hour to arrive at our table. It’s most likely that our order was one of the last ones to be put in from the first seating, but unlike at Frank Pepe, where our pizza came out quite quickly, we had a bit of time to kill before we could indulge. 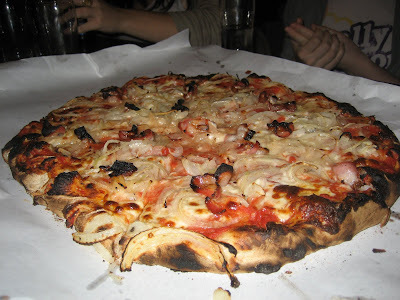 As for what we ordered — although we’d discussed, argued, and eventually compromised on what pizzas to get, all of our work was thrown out the window when our emphatic waiter threw in his two sense. 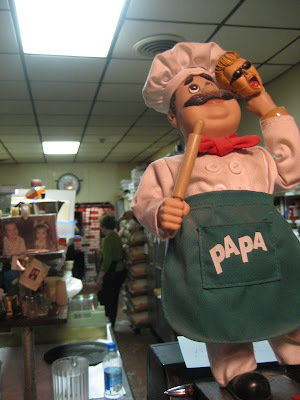 He told us that the clam pie was much better at Frank Pepe down the street and to not even bother ordering it. I like that type of honesty and frankness. We ended up with four medium pies: a bacon & onion pie, a white zucchini pie with tomatoes and onions, a pie with tomato sauce & parmesan, and a plain cheese pie. 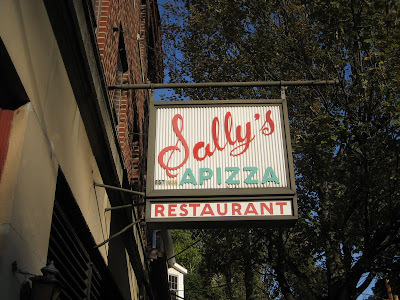 Sally’s was the dingiest of the three places, but in a good way — a far cry from the upscale pizzerias that have been popping up in NYC. The artifacts in the kitchen look like they’ve been around for decades and you could envision Sally’s looking nearly exactly the same 40 years ago as it does today. 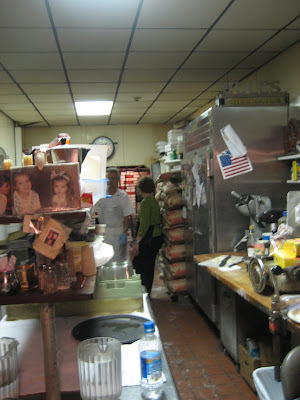 Overall, Sally’s was my favorite place of the day — due to both the quality of food and the atmosphere. 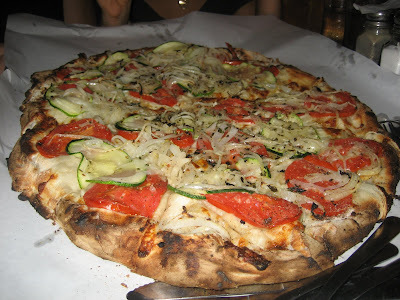 The zucchini pie was the best pizza I had at the three places and none of the other pies disappointed. 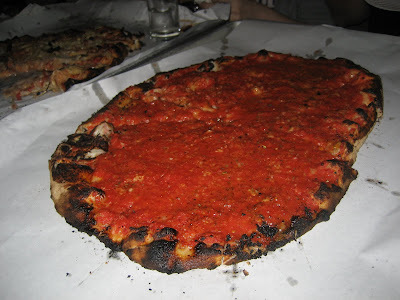 The group seemed particularly impressed with the tomato sauce pie, which essentially lacked cheese other than a tad of parmesan. 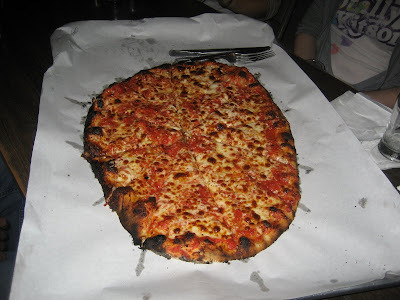 I don’t have a good basis for judging the pie because I rarely eat pizza in NYC without cheese. The nice thing about eating with a dozen people though is that you can try a lot of different pies. I’d definitely like to order more cheese-less pies down the road and see how other places compare. But Sally’s gave me a strong basis as a starting point. Even though we ordered four medium pies (which are really the size of large pies elsewhere, thus making large pies the size of XLs) and ordered at least a dozen beers, our bill came out to less than $100 including tax and tip. 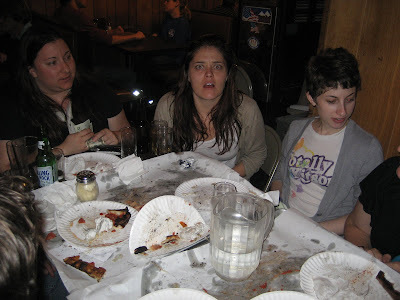 In fact, the one thing that stood out more than anything else at each pizza place was how cheap it was. In the city, you can easily spend $25 at Co or Keste and not be full. In New Haven, everyone was able to fill up on pizza (and beer!) for less than $10 per person at all three places. So even if the quality of the pies suffered a bit when compared to places in the city, the value was remarkable. Not counting our outing at Cancun’s, I spent less than $40 the entire day. I’ve spent that much at Co. during a two hour meal. It’s worth mentioning that a pitcher of beer at Co costs $25, while a pitcher at Frank Pepe costs $7.50. Not too shabby.